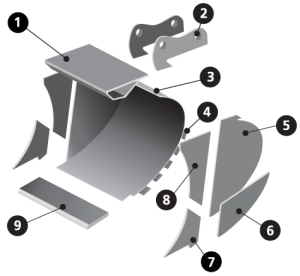 Bucket edges are subject to immense wear and tear during the lifespan. The combination of Hardox 400/450, for light to medium usage or Hardox 500 for heavy duty usage, makes it possible to optimise performance and extend service life beyond that of ordinary steels. Buckets are subjected to sliding, impact wear and high loads. The combination of Hardox 400/450/500 makes it possible to optimise the load performance and extend the service life beyond that of standard steel.